The sun’s setting on Seattle and I’m off to Boston. I’ve only been to Boston in a fly bye, waiting for another plane, so I am looking forward to exploring the city. I don’t have any plans as to what to see or where to go. I am just going to grab camera and head out from my hotel door and see what happens. I just won’t pay those prices the hotels want for wi-fi so the next time I blog I will be back in London and trying to catch up. I treasure your comments so I will answer them all when I get back at my desk with a cup of tea in hand. Cheers for now and hello Boston! Any Boston baked beans about? Gallery | This entry was posted in photography and tagged Boston, England, Seattle, Space Needle, Tales From The City, Travel and Tourism. Bookmark the permalink. My hometown….well Everett, actually…it borders Boston on the north and although a seperate city is really just an extension of Boston’s urban environment! Be sure to get over to Cambridge! Hi Karen, what a city you have! I did get over to Harvard Square and was gutted that I had no room in suitcase for books! Next time! You may not see this until you get back to London, but just in case……..
There’s a restaurant over in Cambridge called Hungry Mother. It is to-die-for good. If you can get a seat, order the pimiento cheese and swoon. Hi Andra, I didn’t get there! I had an amazing time! What a city! Thanks Carrie, I did but it also feels good to be back! You’re so close. Enjoy your visit! Loved Boston!! Love love love Boston! Have a great time! My nephew goes to school there…someday i’ll go visit too! Zannyro, don’t wait! It’s an amazing city! Just loved it! Enjoy Boston, Susan: looking forward to hearing all about it and seeing the photographs! Thanks Kate! I just loved Boston. I ended up with way too many photos to share them all! It’s a great city! I plan to go back again! beautiful picture- wish I could have seen it. Thanks Chris! 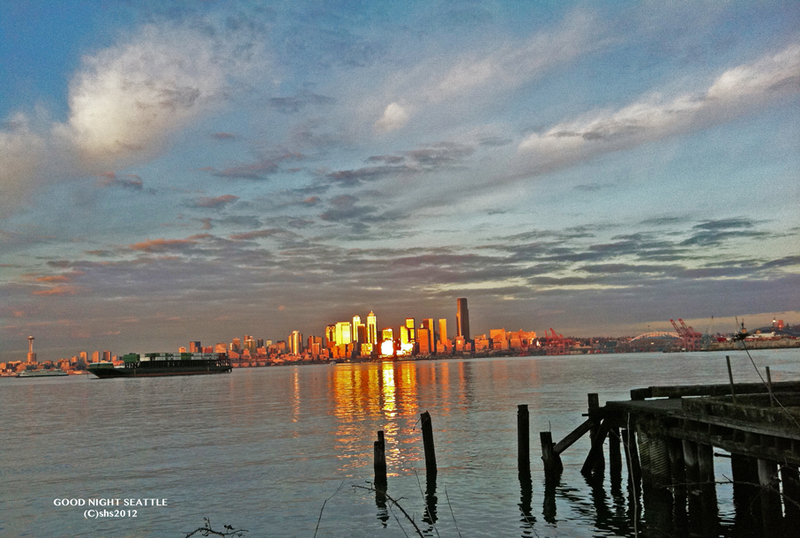 It was taken early in the evening from West Seattle. Seattle is a stunning city.